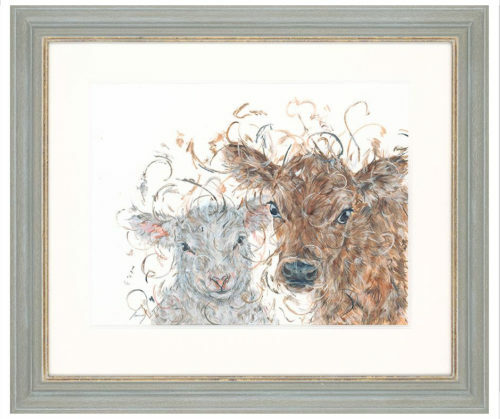 £2,200 professionally mounted and framed to conservation standards with a light wash/gold painted edge frame and glazed with a high quality speciality glass called ARTglass. Growing up together on a farm, this lamb and Jersey calf have formed a tight friendship with many more years to come! Zero interest payment plans available: Pay £733.33 per month for 3 months. 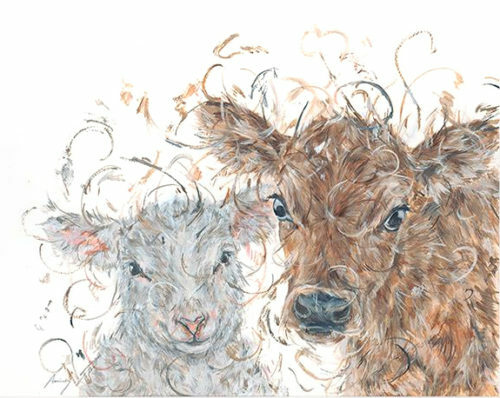 This painting is supplied with a off white double mount, bevel-edged conservation quality mount board and backing board. This gives the painting that extra “WOW” factor. Professionally framed to conservation standards in a frame that has a hand painted finish over which is applied a light coloured wash with a gold painted sight edge, and complete with a high quality speciality glass called ARTglass. What is Artglass? : It is a speciality glass that reduces reflection and improves clarity and vibrancy. From certain viewing angles, the glass appears invisible. In contrast, standard glass (used by the majority of picture framers and is perfectly fine for use when framing most limited edition prints) causes reflection and the impurities in the glass make the image appear duller. 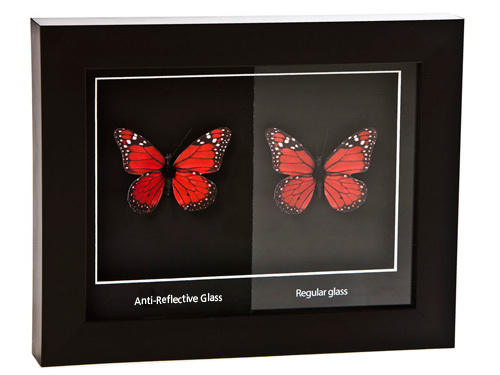 The example shown here shows 2 butterflies, side by side, with ARTglass in the left half of the frame and standard glass in the right half. This scan has not been altered or enhanced in any way and clearly shows how ARTglass improves the clarity and vibrancy of the image. If you would like to purchase this painting, please contact us.